A barbecue grill may be the definitive summer outdoor accessory. As long as you have any space with open air, your home has room for a BBQ. These prized outdoor grilling machines can be a little tricky to transport if you are moving, however. Here are some tips for moving your BBQ grill. Like any item that needs to be moved, the first thing you need to do is prepare your grill for the moving process. 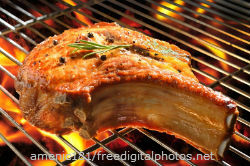 Barbecue grills sometimes get neglected in their cleaning and can be full of ash and grease. You can expect that when you move your grill it will shake off any caked on ash or soot. Trying to move an uncleaned grill is a good way to get ash all over your other items, yourself, and your moving vehicle. Now that your grill is clean, you can physically prepare it for moving. For the purposes of this guide we are going to assume that your grill is relatively big and not an easily portable kettle grill. Remove loose parts: All loose parts, including grates and any other relatively easily removable innards, should be packed separately. This includes utensils, racks, or grill brushes that are usually hanging on to your grill. Remove the gas/briquettes: Propane tanks can't be moved by moving companies, so you'll have to remove them from your grill if you are going to load it on a moving truck. It is always a good idea to remove the propane tank even if you are just wheeling the grill around locally because it makes the grill lighter. Transporting pressurized combustible gas is very dangerous so you may want to avoid bringing the propane to your new home in a personal vehicle, as well. Briquettes aren't as dangerous, but still should be removed and packed separately. Close the grill: Make sure the grill is closed and lock it if there is a lock for the lid. You don't want the lid to swing open during transit. Cover your grill with a moving blanket: Moving blankets are basically thick cotton coverings designed to protect furniture during moves. A blanket/moving tape combination should prevent your grill from getting scratched during the moving process. Almost all grills have wheels to allow for relatively easy movement. Bigger grills will likely require two people to move it. A ramp will also be needed to load the barbecue into the truck. Once the grill is loaded, the wheels should be locked. Most grills with wheels have locks on them, so this should help prevent the grill from moving during the transportation process. Remember to pack and label all the grill accessories that you removed from the grill. 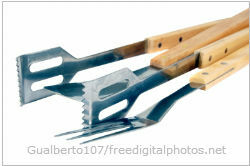 Utensils and grates are pretty durable, so packing them should be relatively simple. They just need to be in a place where they can't come loose and damage other items. Try to keep them together and label them as "grill items" so that you aren't scrambling to find your barbecue equipment after you unload your grill. Once you unpack your grill and reunite it with your BBQ accessories, you're ready to have a post-move BBQ at your new home!